We studied all five senses in one two hour session. But each one could be a week’s theme in itself. Or if you’re in a homeschool or in a five day a week school setting, you could do one sense per day. 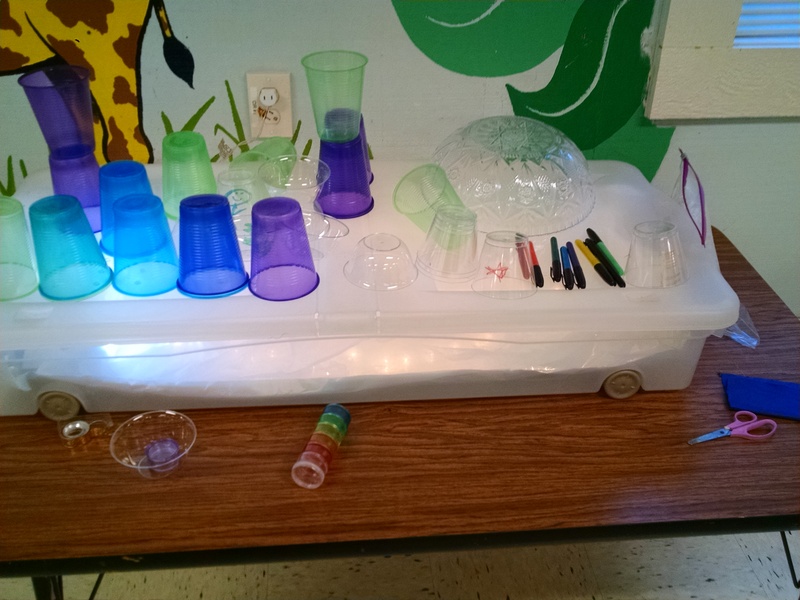 Light table and Lite Brite: We had a homemade light table (plastic tub with Christmas lights in it) and we put on it colorful plastic cups and clear plastic cups they could decorate with markers for imaginary people play. 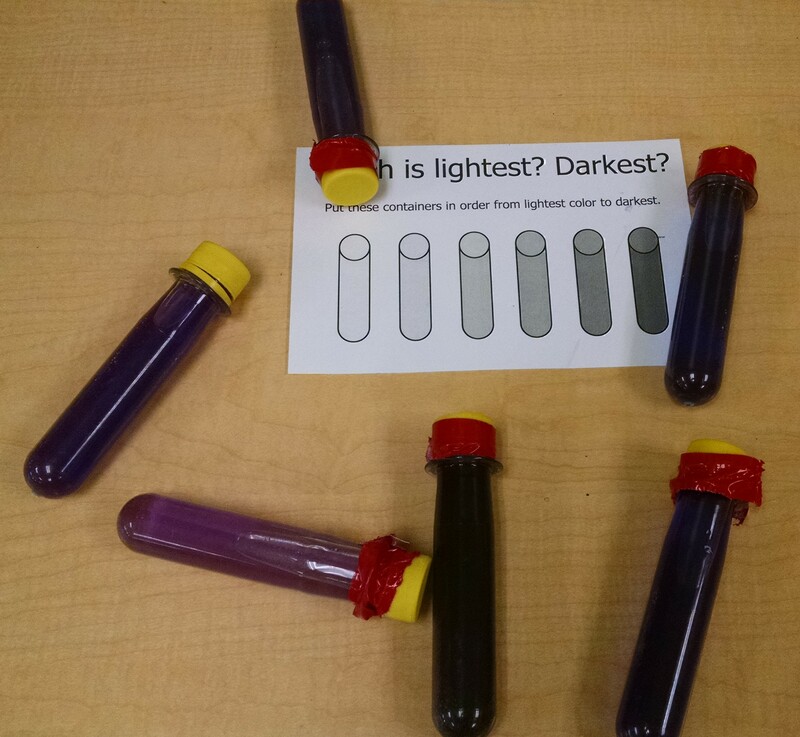 Visual gradient: Take 5 – 8 matching test tubes or glasses. Fill with water. Put one drop of food coloring (or liquid watercolor) in the first one, two drops in the second one and so on. 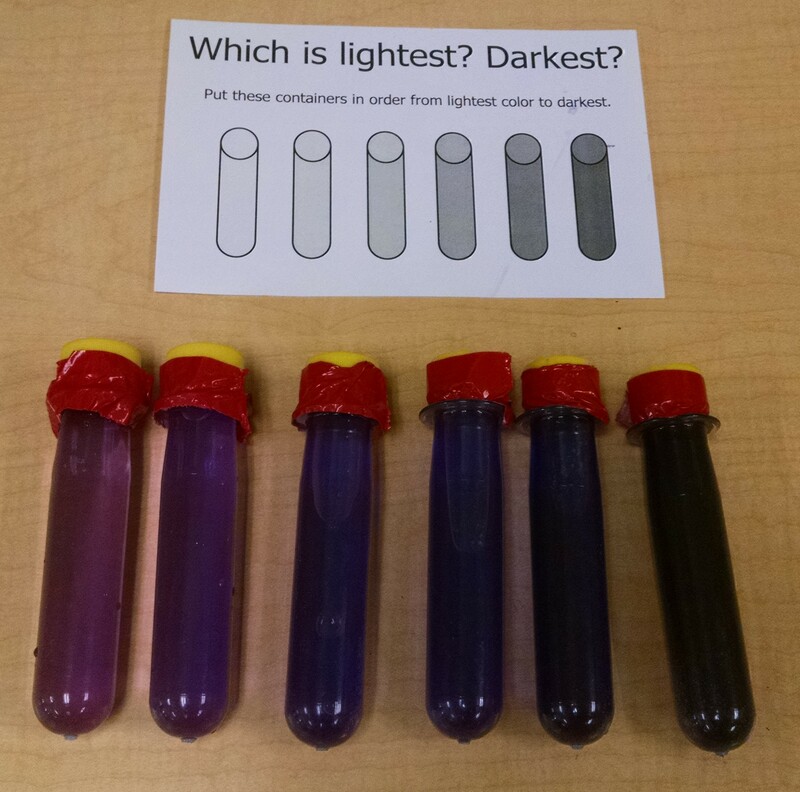 Then mix up, and ask kids to re-sort them in order from lightest to darkest. 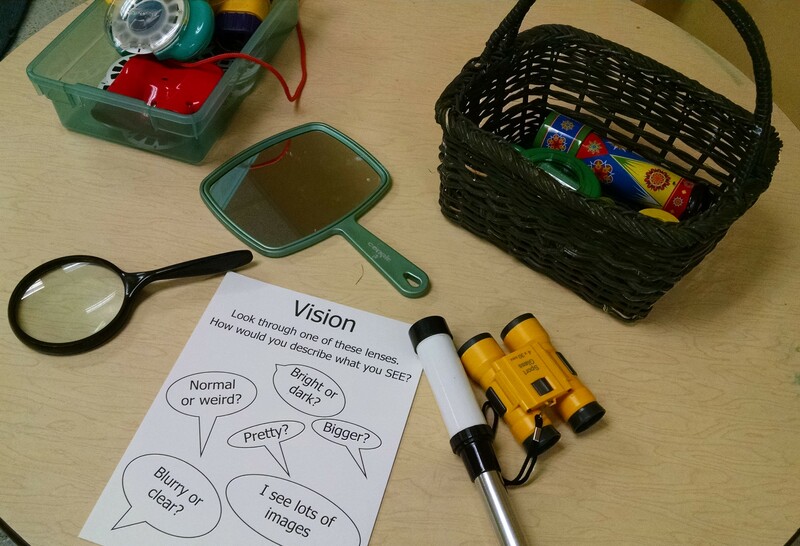 How does using your sense of sight help you use your other senses? On our five senses day, we also had some exercises of: can you recognize this taste without looking at what you’re tasting? Can you recognize the smell without looking in the container to see the item? Can you recognize a sound in a shaker without opening it to look? Thaumatropes: A thaumatrope is a Victorian toy, where there are two images on two sides of a card. It is mounted on a string (like a button spinner) and when it spins, showing first one side, then the next, they seem to spin together to create a single image. This is due to persistence of vision. 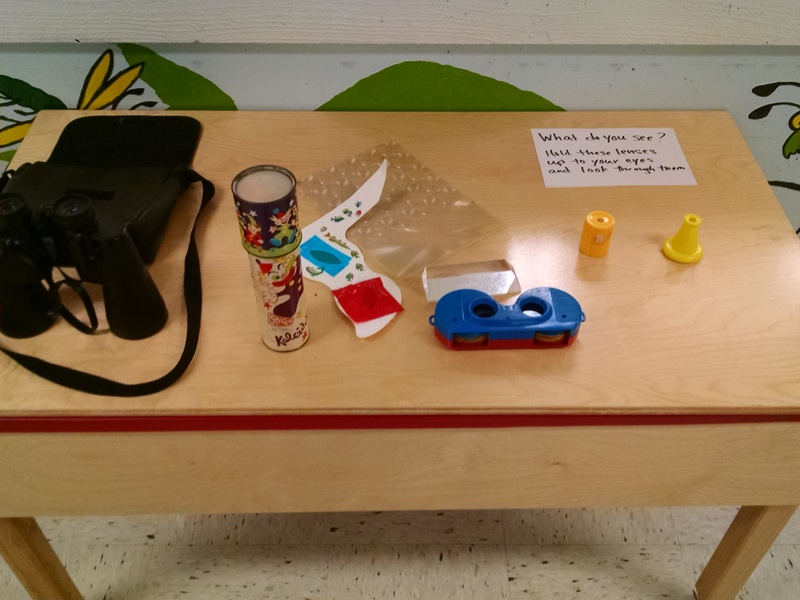 Since we had already made button spinners in two classes, we did a variation on this, as found on What We Do All Day, where we mounted the disks on a straw so kids could spin it by rubbing hands back and forth. 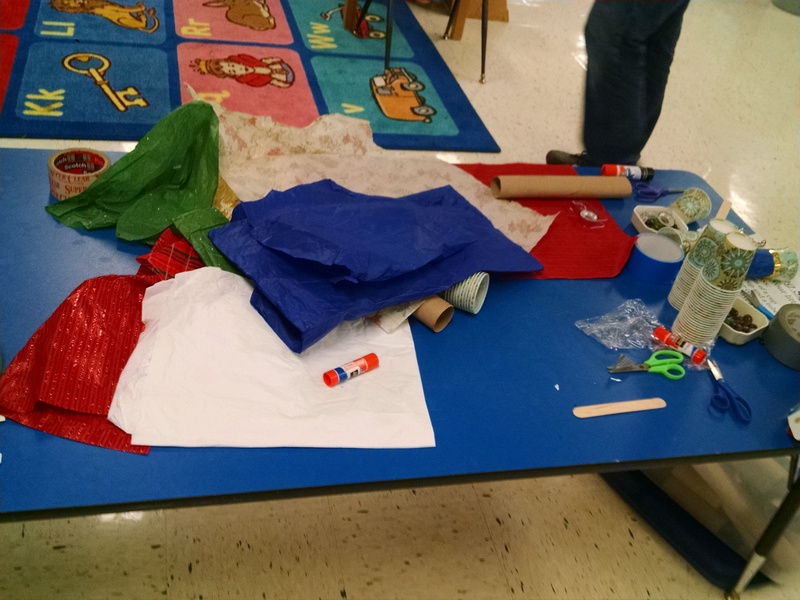 (One of my hidden agendas in my class is to teach my kids a vast array of motor skills!) If you had older kids (7 and up), they could design their own. We used several designs I found online (just search for images of thaumatrope). I printed them, the kids colored them, cut them out, and taped them onto the straw. Note, it’s really important that the straw goes straight up and down with the image… otherwise the images might not blur together properly. Camouflage: We hid plastic dinosaurs in the woods. We were careful to hide the yellow ones near yellow fallen leaves, the green amongst holly and salal, and we hid the velociraptor – the one with stripes on its back under the sword fern. Play “listening tag”. Put the blindfolded child in the middle of a circle. Ask the other children to be quiet. When you point at a child, they talk. The one in the middle points to where they think the talking person is. Then point to another child, and so on. Let them explore a safe obstacle course. Have another child lead them around a room or outdoors. 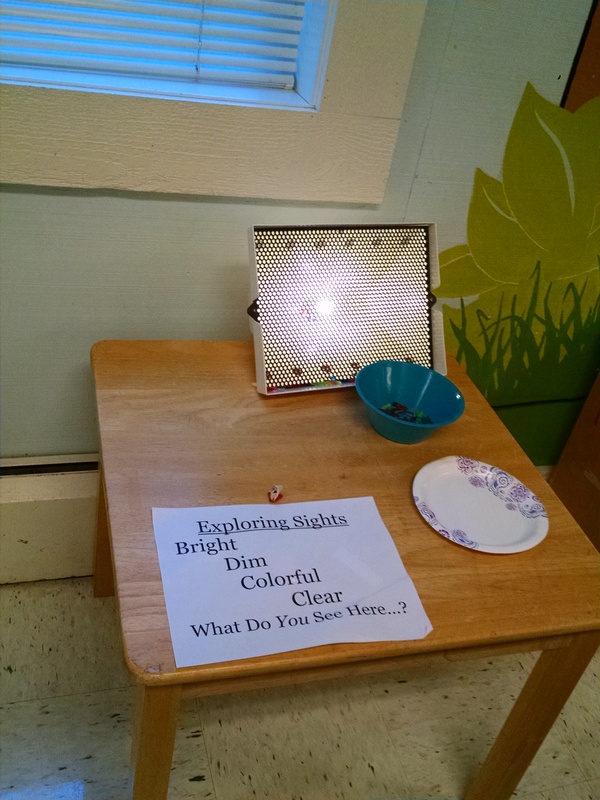 Have them touch common objects and see if they can identify what they are touching. Or play instruments/noisemakers and see if they can identify what you’re using. Or have them smell things. Or taste things… All these things will illustrate how we use all our senses together to create a more nuanced view of what we’re experiencing. Where’s Waldo books or I Spy books give children a chance to practice spying things and looking at details closely. There are LOTS of books on the 5 Senses. I review them all here. Sight day could be a great day to bring in some rainbow activities or have fun with light and shadow. For lots more ideas, including optical illusions, look here.